Colorado correctional officers take pride in maintaining area security and inmate accountability to keep order both in the facility and the surrounding area. Colorado currently has 20,371 incarcerated persons housed in 21 public facilities and a lesser number of privately contracted facilities. Some, like the Denver Correctional Center, consist of several facilities in one mega complex - which facilitates staff professional development, administration, and inmate care. Smaller facilities throughout the state, like Fremont Correctional Facility, Limon Correctional Facility, and the Rifle Correctional Center house fewer inmates. Over the next 10 years, the Bureau of Labor Statistics predicts that Colorado will experience steady growth in the industry on par with the rest of the country as the corrections field expands, and existing officers retire. The state and its private contractors will hire for approximately 500 new jobs created from this growth, coupled with other positions that will be filled. To learn more about the role of correctional officer in Colorado, continue reading. Delta Montrose Technical College ranks first in our latest rankings with twenty-two students completing programs in criminal justice out of a total 336 graduates from the 2012-2013 school year. Remington College-Colorado Springs Campus ranks 2nd in our rankings with twelve students completing programs in law enforcement administration out of a total 200 students. Community College of Aurora ranks third in our latest rankings with 69 students completing programs in law enforcement administration out of a total a thousand students from the 2012-2013 school year. Metropolitan State University of Denver ranks 4th in our rankings with 204 students graduating from programs in criminal justice out of a total 6,336 graduates in the 2012-2013 school year. Colorado Mesa University ranks 5th in our rankings with 73 students completing programs in criminal justice and criminal justice out of a total two thousand students. Hiring is conditional upon completion of the Department of Corrections Basic Training, random drug screening and assessment as to whether or not they are able to learn and perform the PPCT (Pressure Point Control Tactics) used by the state. Tuberculosis screening is also required of all newly hired staff. Applicants that are dissatisfied with their disqualification may appeal in writing to the state for assessment and adjudication. 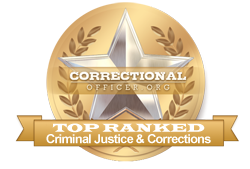 The state Department of Corrections in Colorado encourages civic-minded citizens to look toward the corrections field for fulfilling and lucrative career opportunities. At this time, the median income for correctional officers throughout Colorado is higher than the national average at $43,700, with the national median income at $39,800. and according to occupational data for the state of Colorado, available at http://www.careerinfonet.org/occ_rep.asp?next=occ_rep&Level=&optstatus=011000000&jobfam=33&id=1&nodeid=2&soccode=333012&menuMode=&stfips=08&x=45&y=8 and published by CareerInfoNet.org, state trends are predicted to experience a 16% growth curve from now until 2022 as compared to the national growth rate of 5%. This predicted growth pattern translates into 370 new openings and existing vacancies annually. The table below lists career information retrieved from the Bureau of Labor Statistics for correctional officers in Colorado. The table is sorted by total employment, with the largest metropolitan areas listed first.